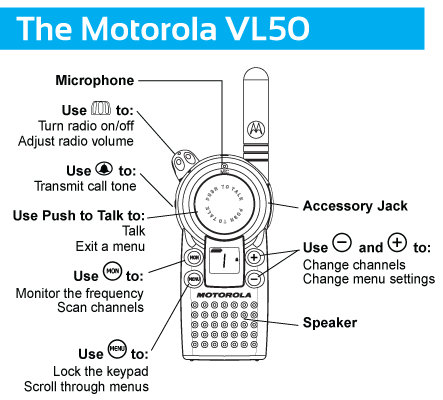 The Motorola VL50 radio comes pre-programmed so your ready to start using your radio directly out of the box. The VL50 is the big brother to the CLS series radios offering more channels and features. Availability: 299 In Stock. Need More? $217.00 To see product price, add this item to your cart. What's this? As a part of Motorola's Value Line, the VL50 makes it easy and affordable to empower your staff with instant push-to-talk communications. The VL50 was designed to help you maximize productivity and give you the edge needed to compete in today's competitive business environment. The small size of the VL50 lets you move easier through your workday. It also means this device is discrete, keeping customers focused on you and not your radio. Weighing only 4.6 oz., this radio is Motorola's lightest professional radio, and their easiest to operate; with a solo top knob for volume controls, an LCD screen for quick battery & channel checks and a large front push-to-talk button. Keeping your radio fleet organized is essential to peak efficiency and productivity. With the Motorola 56531 Multi-Unit Charger, you can not only keep your fleet organized & charged, but you can also use the charger to clone programming into multiple radios at once. Saving you time and money by speeding up your software updates! There's no need to stop working just to use the radio. Keep productivity at maximum levels by making your push-to-talk communications HANDS-FREE, with this lightweight over-the-head style accessory. The Motorola VL50 has all the features you need for simple two-way radio communications: 8 Channels, 7 Call Tones, 12 Hour Battery Life, Keypad Lock, and an LCD Display.